There's water everywhere in Gorakhpur – be it the 17,000 acre large Ramgadh Taal lake or the five small rivers like Rapti and Rohini. As a result, the livelihood of several communities is centered around water bodies. Broadly classified as Nishad, these communities include at least 15-16 sub-castes such as Mallah, Kewat, Dusadh, Bind, Rajbhar to name a few. They account for 14 per cent of the population in Gorakhpur district. Armed with this numerical strength, a new political outfit is out to alter the political equations in the region – the Nishad Party. This is not the party's real name. It is a shortened version of its rather long-winded name – Nirbal Indian Shoshit Hamara Aam Dal (NISHAD). The party's chief is Dr. Sanjay Kumar Nishad. The Nishad Party is giving sleepless nights to all the major parties – the Samajwadi Party, Bharatiya Janata Party and Bahujan Samaj Party. In the past, the Nishad community haven't voted en bloc for any one party. The community has tended to support Yogi Adityanath in the city and in the rural areas they have alternated between SP and BSP. A lot also depends on individual candidates. In the Gorakhpur Sadar seat, the Nishads have traditionally supported Adityanath and the BJP. But this time they have made it clear that their party is the Nishad Party. 22-year-old Diwakar Nishad, who works as a driver with a travel agency, says, “Dr Sanjay Nishad has made us aware about our history. We came to know that we have a great tradition. Now we have found a leader. We won't vote for any other party”. This sentiment is echoed across the Mallah settlements, among young and old alike. Despite their numerical strength, Nishads weren't able become a political force on their own. Nor did they have any influential leader. This time both these obstacles have been removed. In Dr Sanjay Nishad, the community has found a leader. Dr Nishad has cleverly woven a coalition in the area, comprising the Dr Ayub's Peace Party and the Krishna Patel faction of the Apna Dal. “This is the real Mahagathbandhan. This is an alliance of four parties. BSP has helped only Chamars, SP has helped only Yadavs. Other Dalit and backward communities have remained deprived. 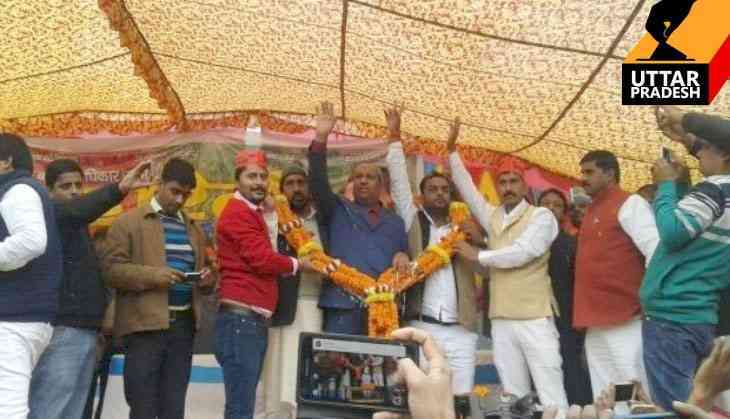 We will show SP, BSP and BJP their place,” Dr Nishad said. This alliance is contesting around 150 seats across UP. But it is only in the 14 seats in and around Gorakhpur that the alliance can distiurb the calculations of the major parties. This is largely courtesy the Nishad Party. Dr Nishad is contesting from the Gorakhpur Rural seat, where Nishad voters are around 90,000 in number besides around 1.25 lakh Muslim voters. There is a wave in favour of Dr Nishad within his own community. If this holds true in other seats, the Nishad Party may be able to cause a few upsets. “Our people voted for BSP, they voted for Yogi Adityanath as well. But these people never let Nishads progress. Yogi (Adityanath) never allowed a leader to emerge from among Nishads. He only promotes people from his own caste,”Dr Nishad said. One being asked whether his party will succeed just on the basis of Nishad votes, he said, “Pasmanda Muslims are with Dr Ayub. They are in extremely high numbers in this area. Ansaris and weavers will support us. The Paswan community will support us. They were being taken for granted so far. We have given them tickets”. The Nishad Party has become influential enough to give a headache to the major parties. This was evident in their ticket distribution as well – BSP gave tickets to 4 Nishads, SP 3 and BJP 1. But the community seems to be decisively moving towards the Nishad Party. The community which is dependent on water bodies for their livelihood, is preparing for a wave.